The Peony is a fun, community based cocktail and buffet celebration, held in the Visitor Center courtyard. If you haven’t attended, you should join us just to see the amazing Peony garden in bloom! A fundraiser for the Friends and our projects in the Preserve, the evening features a fine art exhibit and a flower show presented by local gardening clubs. Chaired by Terry Marchica, local garden clubs donate spectacular floral arrangements. A Silent Auction accompanies the show and all arrangements are available for bidding - take home a stunning masterpiece! Some visitors are not familiar with how these beautiful flowers came to grace our park. Following the tragedy of September, 11th, a Town in Shimane Prefecture, Japan wanted to express a gesture of healing and solidarity towards the United States. 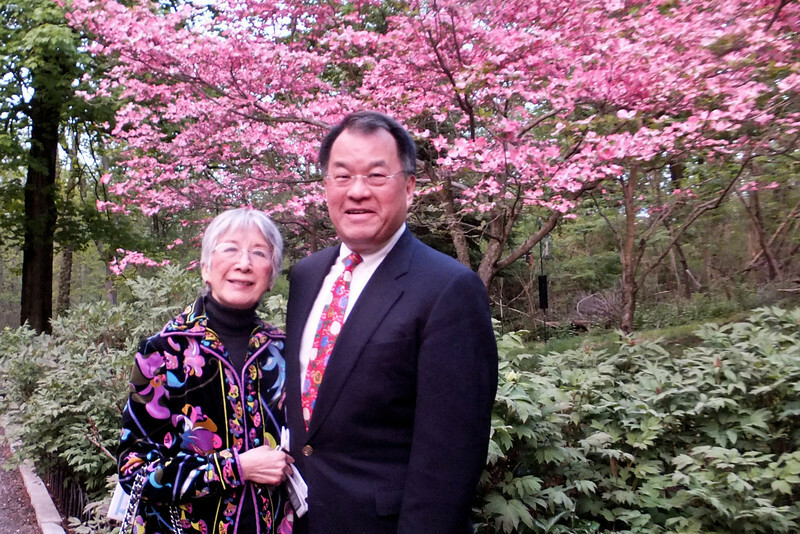 They sent the Rockefeller State Park Preserve a gift of 500 peonies from Yatsuka Cho. The Peony is considered Japan’s “most noble of flowers”. The gift was intended to promote the healing process and to symbolize the blending of two cultures by placing the Japanese flowers on American soil. The Friends initiated a major landscaping project around the gateway to provide a worthy site for this generous gift. Mr. Yatsuka Cho graciously sent over Japanese gardeners to plant the flowers and to teach the Preserve Staff how to care for them. The cost of the Gateway Preserve Project was generously underwritten by the Friends Board of Directors, the Rockefeller Family, the Japanese Chamber of Commerce and Industry of New York, and donors from surrounding communities. The result is an inviting entrance that serves as a gateway to our entire peaceful Preserve and exemplifies the beauty of people coming together in a time of need. We welcome you to share these magnificent flowers, that are now maintained by a dedicated group of garden volunteers, and thank you for supporting the Preserve!